Two works in in one volume. Both First Editions. Translated from the Latin by Donatus Acciaiuolus. Printed in Roman letters, 41 lines to the page. The Maurice Hewlett copy with his bookplate as well as others. Stained in places. Recent vellum. Folio. Goff B-1247 and Goff P-873. Bruni's was the first history of Florence based on a critical examination of documentary sources. Extending from the Roman period to 1404, it honors the Florentines for perpetuating a tradition of struggle against tyranny. 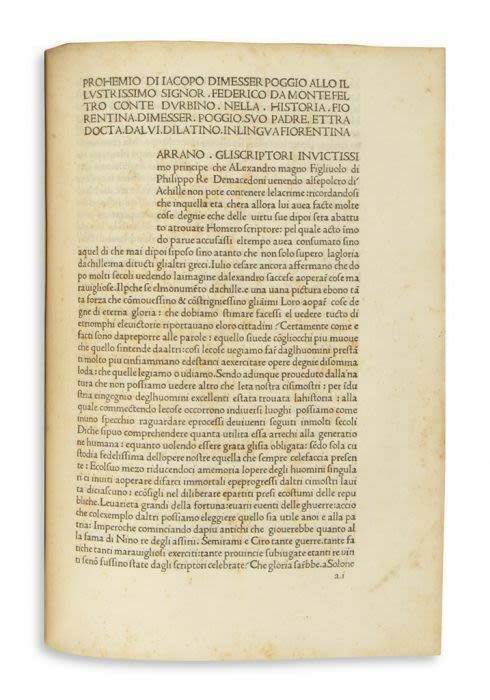 Copies are often found bound with Poggio Bracciolini's history of the Florentine republic which covers the years 1350 to 1455, printed by the same printer within one month of the Bruni.